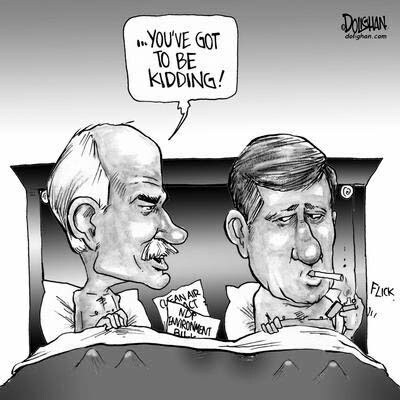 Very few people realize that the reason we have Stephen Harper and his Conservative Reform Alliance Party in power is because of Jack Layton and a deal with the devils that has haunted Canada for the past seven years. I was blessed on many occasions to have the honour of working with Jack Layton at many educational and environmental conferences when he was still a Toronto City Councillor. They were the heady days of the late eighties, early nineties when thepublic was engaged in the pursuit of environmental literacy. We were constantly in demand as keynote speakers and workshop leaders. Jack and I had a few things in common – we were both natural speakers, no need for notes, instantly engaging with audiences, both passionately honest about finding positive solutions to environmental issues. The only difference was that I approached my keynotes and workshops in the role of teacher; Jack did so as the consumate politician. I never realized how this would affect the fate of Canada until 2005 when the Liberal government under Paul Martin was defeated in a non-confidence motion because the NDP voted with the Conservatives and Bloc to bring down the house. In my limited political sphere, the only other person I ever heard talk about the significance of this was Martha Hall-Findlay, vying at the time for a role as leader of the Liberal Party of Canada. When asked if she would ever consider a coalliton with Jack Layton and the NDP, her response was immediate and intense, "Jack Layton cost Canadians Kyoto, Kelowna, and kid's National Child Care. The answer is NO." Intrigued by the passion ih her response, I did a little digging, and this is what I have concluded. The Chretien goverment of the nineties put in some of the toughest austerity measures this country has ever seen. Within nine years they had erased the Mulroney deficit and created a surplus, all under Minister of Finance Paul Martin. Ego and impatience led Mr. Martin to finally go for the gold, and Mr. Chretien wisely "retired" and left with his golf balls to allow his successor to deal with the fallout from the Sponsorship Scandal. Mr. Martin finally got to become Prime Minister but had to face the wrath of a Canadian public who dealt him a minority government. Nevertheless, his agenda was ambitious. The Liberals finally had enough money in the coffers to put together their dream bills: a full commitment to the Kyoto Protocol for environmental security, the implementation of the Kelowna Accord for our First Nations Peoples, and a National Child Care policy. All this was finally doable because their economic policies had been so successful. And of course, the NDP would support these bills because it was a top priority in their manifesto. This was the environmental sustainablity, social justice, and economic security that Canadians had been promised years before and it was finally coming to fruition. It was everything in which Jack Layton believed. And it would mean the death of the NDP. Jack knew better than anyone else, that if the Liberals passed these bills into law, the NDP would have no platform in the next election. The Liberals would hold the higher ground, and the little party to the left of centre would be irrelevant. So Jack made a decision recognizing that the destruction of the Liberal Party of Canada was the only way the NDP might ever rise to power. He held his meetings with Mr. Harper and Mr. Duceppe in the summer of 2004, putting together an agreement, signed and sealed, that would request that the Governor General approach the Conservative, NDP, Bloc "coalition" as a viable governing option should the Liberal government fall to a non-confidence motion. The government did fall in that non-confidence vote, and a national election was called. During that election campaign, Mr. Layton uttered nary a word against Stephen Harper. Mr. Martin resigned after the election defeat, and the Liberals started a series of ill fated-leadership campaigns. Mr. Harper became Prime Minister and began to slowly remake Canada in his image. That deal with the devils sealed the fate of Kyoto, Kelowna and National Child Care, and Jack sacrificed everything he believed in for the survival of the NDP Party. His fondest dream and his worst nightmare finally came true in the federal 2011 election, when the NDP rose to the status of Official Oppostion and the Conservative Reform Alliance Party of Canada, already holding a pork-barrel majority in the Senate, became the majority ruling government of Canada. There is now a statue of Jack Layton, lovingly erected in Toronto, quoting some of his last inspirational words to Canadians calling for hope, love, and optimism. There was a concert with wonderful tributes to a man who is well loved and who captured the imagination of the country in his last campaign with a winning smile and a cane-wielding bravery that was inspirational. In my imagination, looking back to the events of 2004, and the events that led up to the results of 2011, I hear the last song played is Bruce Cockburn's "And They Call It Democracy" and behind the statue of Jack, one hand on his shoulder, smiling like a cheshire cat, I see a statue of Stephen Harper. His inscription merely says, "Thank you, Jack." This entry was posted in Politics by Skid. Bookmark the permalink.